We sell our Single Bay rod holders without hardware because there are so many different applications for them that there is not any one hardware kit that would apply to them all. So that is why we are offering the hardware kit separately so those who want to use them with the Single Bay rod holder may do so. 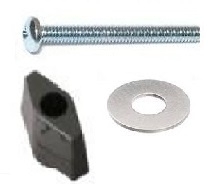 Included is one T-Knob, one 2 1/4" X 1/4" Phillips machine screw, and one fender washer. This kit will work for adding a Single Bay rod holder onto the pontoon railing where a Triple Bay Box rod holder will not fit. GREAT FOR:: Attaching Single Bay rod holder to pontoon railing.